My New Year’s Resolution for 2012 was to limit my television viewing to no more than two evenings a week. Even when I do watch TV in the evening it isn’t more than 9pm to 11pm but, I decided even that small amount was eating up a lot of time for little return. It was a bad ROI (Return On Investment). I have kept to my resolution this past 11 months and because of this have read a number of books this year. 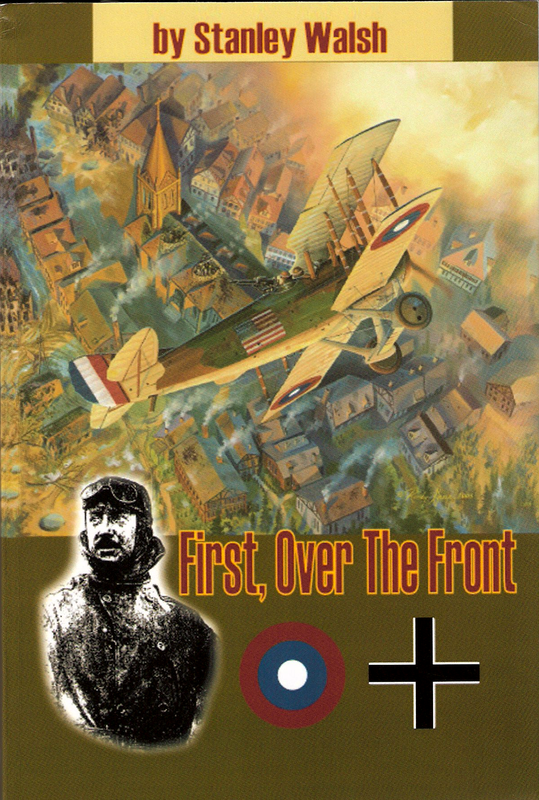 One of these, “First, Over The Front” by Stanley Walsh is the subject of this report. I have never read a book quite like Walsh’s piece before and found it very interesting on a number of levels. Basically, it is a collection of the letters of Lt. William G. Schauffler, Jr. who was a reconnaissance pilot for the American Expeditionary Force. Schauffler was “the right guy in the right place”. He was a man with a natural talent for observation. The U.S. Army recognized this and put him in the Aerial Observation Group where he performed admirably and was quickly promoted to Squadron Commander. For us, though, his talent as an observer serves us in the detailed letters he regularly sent to his family back home in America through his wartime stint. Because of his diligence and talent, “First” is a treasure trove of personal insights into the daily life of an Air Warrior during the first military use of The Airplane. If it were merely a collection of letters, though, it would not have its power. Due to Walsh’s skillful editing and by the imposition of his many “background” and explanatory notes, the narrative is made complete. This book is a window into a time that will never be again. WWI was billed at the time as “The War To End All Wars”. This in itself is a reflection of the mindset of the time. The Western World was making huge strides in science and technology and people really embraced the possibility of a coming New Age of Man. Without going into great detail, I think it is sufficient to say that in many cases the technology of the time had outpaced the imagination of the leadership. This was definitely the case when examining the overall strategy and tactics used by The Commands on both sides of the trenches. They simply were not grasping the totality of change that industrialization had brought to the battlefield. For the most part they were slow to update strategies that would best employ the new devices and massive scale of these devices created by modern industrialization. While growing up I read all the stories I could find about The Fighter Pilots. At one time I could recite lists of the Famous Aces with their “kill” records. My Dad was a Fighter Pilot and to me there was no greater calling on earth than to be counted a member of this hallowed profession. “First” does not denigrate that belief but it does enlarge my recognition of the valuable contributions made by other aviation missions performed during The Great War and, by extension, the wars since. Even though “The Big Stars” of WWI were The Fighter Pilots, a good case can be made that their contribution to the overall war effort was minimal. Also, after reading “First” and discovering how the Aerial Observation Corps was utilized in conjunction with artillery, I now understand why the Fighter Aces worked so hard to shoot down observation planes. Notwithstanding the general “backwardness in tactics” of the French and German High Commands, the U.S. and French did quickly embrace the airplane when they found how useful it could be to increase the effectiveness of their artillery. I won’t give away too much from the book but in reading it I learned that they even developed “real time” reconnaissance methods for improving the aim of their weapons. This use of the airplane became decisive in ending the war with Victory for The Allies. “First” does give a good account of battles and some very vivid recollections of the intensity of war but it is not primarily a “War Book”. The real thrust of Schauffler’s reports is his coverage of the human side of the conflict. By doing this he takes us into the world of the early 20th Century through the eyes of a contemporary – and, better yet – Through The Eyes Of A Pilot Of That Time. I think the most important thing he left me with was the overriding sense of Duty, Honor and Country he and his fellows had. They were also in search of Adventure. These were Virtues Men Were To Possess and Things Men Were Expected To Do. Not once in the book does he go into the type of lame “soul searching” commentary we are so accustomed to these days in books and films about war. He never burdens us with the faintest hint that he or any of his comrades would cry or whine regardless of the issue. He talks with great relish about besting the Germans. A few times when the Germans got the upper hand Billy is ready to turn back the next time and make them pay for it. He and his friends went to France to Win The War. Then, our nation had no silly ideas about “nation building” or “infrastructure development”. These guys went there to beat the Germans (sometimes called “The Hun”) and then come home. They were focused and intense. They were too busy embracing life to fear death. Their Christian upbringing taught them that if they did die in combat, they were still safe in Heaven. Therefore, their biggest concern was not to embarrass Themselves, Their Unit or Their Families with cowardice or failure. There is much to learn from pilots like Lt. William Schauffler, Jr. He was a Pilot’s Pilot and went on to become an important player in World War II. I can tell you I learned many new things about Warfare, America and Victorious Living by reading this book. I think you will, too. I very much enjoy following all of your “Sky Surfing” stories and photos. I have a few comments related to your Bartlesville and Ponca City trips. I grew up in Bartlesville and joined the Navy right out of high school in 1945. In 1935, Will Rogers and Wiley Post were in Bartlesville shortly prior to their deaths in a plane crash near Barrow, Alaska. My father and I went out to the Phillips airport (now Bartlesville’s Frank Phillips Municipal airport) and saw Wiley Post in person along with his aircraft. We also went to see Will Rogers appear in person on stage at the Bartlesville munical auditorium. Frank Phillips was an ardent supporter of early day aviation, and I am sure it was due to him that they were in Bartlesville. This must have been only a few weeks before their deaths. I have returned to Bartlesville many times over the years, both to the Biplane flyins, and other flyins. In later years, I lived and worked in Ponca City. Your mention of the Marland Boys home, was possibly located on the former grounds of the E.W. Marland mansion just on the eastern edge of Ponca City. E.W. Marland was an early day governor of Oklahoma, and founded Marland Oil Company which later became Continental Oil (CONOCO). The rather ornate hanger at the Ponca City airport you had in a photo was originally the CONOCO hanger, not Phillips. I still fly, but now only as a Light Sport pilot in my 1946 Aeronca 11AC Chief. Keep up the excellent Sky Surfing. Thank you very much for the kind words and the personalized history lesson (I am making the update regarding the CONOCO hanger right now). I am always very happy to hear that people are reading my stories. I try to make them factual and interesting. Earlier this week I spoke with my mechanic “Rotax Rick” who is rebuilding my Quicksilver’s Rotax motor. He made me a deal on a new crankshaft that I have decided to buy. Rotax no longer makes the motor I use and the availability of these parts over the next 10 years is problematic. Buying the new crank now makes the next overhaul more predictable in cost. I asked him to finish the engine rebuild for a return after Christmas when I can better afford the updated expense. I also tore out the bearing assembly for the entire drive train and am replacing it with new elements. All of this will set me in good stead for a return to the skies perhaps as soon as March. This has been a warm Winter and I think that is quite possible although April is more likely. I have some new venues picked out as well as a new destination “concept” I will reveal after accomplishing the first one. Also, I have taken a lot of pictures of the overhaul and will do a story on that. “Rotax Rick” will be providing some shots of his process also.